Trash into treasure! It's really cool to recycle and upcycle some old and unnecessary stuff. First of all, it will cost you nothing, secondly, by recycling you make this world better and save our planet. Plastic bottles are a good source for crafting – your possibilities with plastic are truly endless. Learn to make awesome and useful crafts from plastic bottles in no time. You can't even imagine all those awesome crafts that you can make out of plastic bottles. For example, check out that amazing tissue holder that we've made out of an empty detergent bottle. Use a bit of imagination! Another cute craft of a kind is lovely plant pots. You can make a spiral out of an empty plastic bottle and use it together with a hanger to store all your socks. We'll teach you how to make amazing colorful bracelets out of plastic bottles. Make one for you and one for your bestie. Will you believe me if I say that you can make even furniture out of plastic scrap Find a cool tutorial on making a comfy chair and repeat it at home. You can choose any fabric color that matches your mood or the walls in your room. 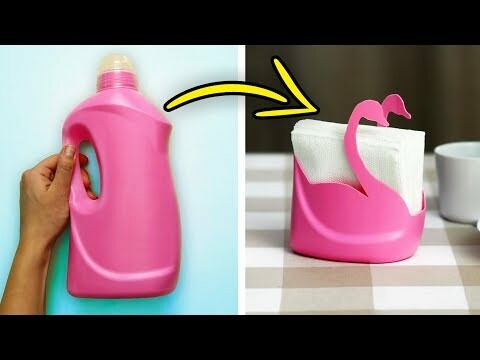 Watch this video up to the ned and see a lot of quick hacks and fixes that we've done with plastic bottles. For example, comfortable knitting device, finger protection when cutting veggies, and what not!